Discover the forest with the fox, the badger and the squirrel. In the forest there are many different trees, mushrooms and berries and, of course, many other animals. This is a 100% natural book, made with 100% recycled paper and printed with ecological ink. Explore the garden with the hedgehog, the mouse and the sparrow. Beautiful flowers, delicious fruit and vegetables grow here. Many other animals live on the grass and underground. Katrin Wiehle has explored the natural habitat of the forest, the garden and the pond and she has now awaken the passion for travelling. "My little jungle" is a new book about nature, 100% natural in its concept, in what it tells and in the materials used. All children know that the exotic animals in the zoo come from a far away jungle, where there are high trees, thick creepers and mysterious creatures. With warm colors, clean lines and the kindest characters, the author of "My little forest" offers us an inimitable image of the jungle. Together with the monkey, the parrot and the jaguar, she invites the littlest ones to know the jungle, to climb to high trees, to find wild animals that live there and to search for delicious fruits, awakening the interest and curiosity of the youngest ones for the environment. The little pond is full of surprises! The duck, the fish and the frog show what animals live in and out of the water and what plants grow there. 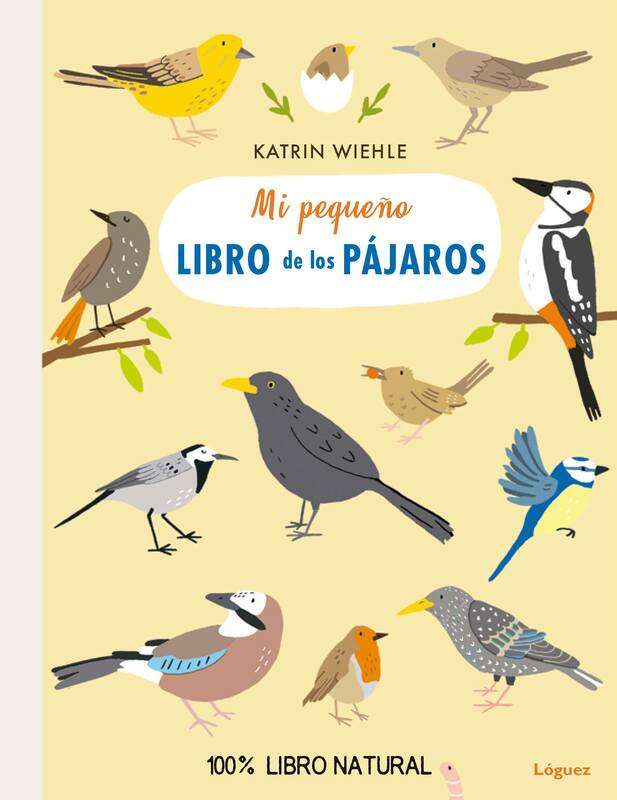 A new lovely book by Katrin Wiehle dedicated to nature and sustainability topics. Katrin Wiehle, with soft earthy color and simple figures, using a cardboard 100% made of recycled paper and natural ink, achieves a wonderful efect. With brief simple texts and clear shapes offers to the youngest readers knowledge about their environment. En el nuevo título de la exitosa serie de libros ecológicos, la foca, el cangrejo y la gaviota muestran dónde viven y lo que se puede descubrir en el mar y en la playa. ¿Qué pez tiene puntos rojos? ¿Qué aspecto tienen las gambas? ¿Qué plantas crecen en el fondo del mar? A través de sencillos textos y dibujos, los niños aprenden a conocer el mar como lugar habitado. Katrin Wiehle, con formas claras, suaves colores y figuras entrañables, incrementa el interés por el medio ambiente. Libro 100% natural. Hecho con el 100% de papel reciclado e impreso con tintas ecológicas. "Una propuesta interesante para que el lector aprecie más el medio que nos rodea" (Canal Lector). Together with the chamois, the marmot and the eagle, come climb the mountain! Among green valleys and snow covered peaks there are big and small animals and so many plants to discover. Explora el jardí amb l'eriçó, el ratolí i el pardal. Aquí hi creixen boniques flors, gustosa fruita i verdura. Molts altres animals viuen a l'herba i sota terra. 100% llibre natural, fet amb el 100% de paper reciclat i imprès amb tintes ecològiques. Descobreix el bosc amb la guineu, el toixó i l'esquirol. Al bosc hi ha molts arbres diferents així com bolets i, naturalment, molts altres animals. Con hermosas ilustraciones y personajes adorables, este libro cuenta la historia de lo que hacen los animales y los humanos en diferentes estaciones. En la verde primavera, las aves comienzan a anidar y se puede saltar en los charcos. Después empieza a hacer calor y todos se reúnen en el lago para nadar o comer helado, ¡el verano está aquí! En otoño, las aves migratorias se marchan, el erizo busca un lugar para hibernar y la ardilla esconde nueces. ¡Y cuando llega el invierno, hacemos muñecos de nieve y patinaje sobre hielo!